formerly Bow Tie Criterion Cinemas at Blue Back Square (Bow Tie Cinemas). Acquired by Cinepolis USA in mid-2016. 1 One comment has been left for this theater. We did not receive showtimes from you for this date. To get your showtimes listed here, please see Submitting Your Showtime Information. It's free for all U.S. movie theaters! Select a date from above to see this theater's schedule for that date. The dates that appear as links are dates in which we have schedule information for this theater. Click here for additional help documentation. 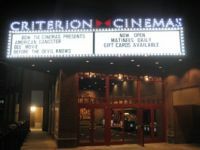 This movie theater is near Hartford, West Hartfrd, West Hartford, Newington, Farmington, Bloomfield, Wethersfield, New Britain, East Hartford, Avon, Silver Lane.